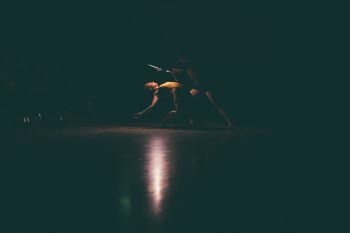 Raymond Chai is creating an as-yet-unnamed duet for Cloud Dance Festival, about the tensions and unspoken challenges in fleeting relationships. It's to be performed by Melanie López and Oliver Freeston: previously appearing in Cloud Dance Festival in December 2009 with Diciembre Dance Group, Melanie has also worked with Peter Schaufuss Ballet, Ballet Ireland and Avatara Ayuso, while Oliver has worked with the Georgian State Ballet, Peter Schaufuss Ballet and Company C Contemporary Ballet, and performed at the last Cloud Dance Festival with Sol Dans. It'll be great to have both of them back! Raymond Chai's duet will be performed on Saturday 6 and Sunday 7 July, and you can read more about it here. Merritt Moore and Adam Kirkham are fast becoming the most popular part of this festival, so it was wonderful to catch the start of one of their rehearsals last weekend. Merritt's friend Erica Fletcher was visiting from Texas and photographing and filming the rehearsal, so here are photos taken by her. Merritt and Adam will be performing A Timeless Duet on Saturday 6 July, and you can read more about it and them here. These photos were taken at a rehearsal at Artsdepot, with Alanna Kajdi and her brother Jason, Sophie Lucas and one other dancer. The first part of the rehearsal was used for Alanna to teach the choreography to a dancer who will be replacing her in this piece, while most of these photos were taken from an exercise in manipulation which took up the second half of the rehearsal - and involved a lot of Jason-bashing! Kadji will be performing M/S.P/E (Metamorphosis/Soldiers Poem/ Experience) on Saturday 6 July, and you can read more about it here. When Paolo Mangiola originally applied with Nuclear Romances, I was thrilled to see that Fukiko Takase would be performing in it; she'd performed in Devaraj Thimmaiah's Arranged Marriage, which was one of our favourite works of the previous festival. 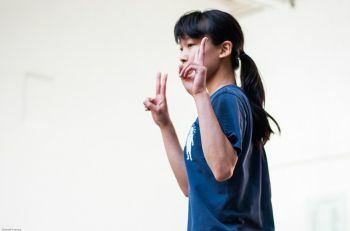 But Fukiko was not available for the festival, so Chihiro Kawasaki had to quickly learn the role, before Paolo left for Japan for a study trip funded by the Lisa Ullman Travelling Scholarship Fund. Nuclear Romances was performed on Friday 5 July, and you can read more about it here. These photos were taken at Ieva Kuniskis's final rehearsal before taking Gone To Get Milk to Lithuania to perform at the prestigious Baltic Dance Festival. As Zoe Georgallis could not join Helen Aschauer and Charlie Ford for this and other performances in Lithuania, Ieva Kuniskis took over her role. Ieva will be presenting Gone To Get Milk on Sunday 7 July, and you can read more details here. Volta is Ceyda Tanc's latest work, and it has been performed widely since its premiere at Resolution! at The Place earlier this year (on the same night as Ieva Kuniskis) including at the Brighton Fringe in The Famous Spiegeltent. 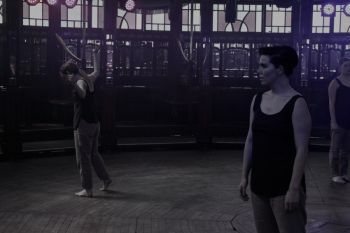 As Ceyda Tanc Dance is a Brighton-based company, there hasn't been a chance to pop down for rehearsals, so here are some photos taken by Ceyda's sister Amber Tanc at the Spiegeltent in Brighton. Volta will be performed on Sunday 7 July, and you can read more about it here. These aren't rehearsal photos so much as a photoshoot by Hana Saotome and two of her dancers, as she needed some publicity photos for Sombras do Tempo (shadows of time), which she'll be presenting at Cloud Dance Festival on Saturday 6 July. This will be the third work she has created for Cloud Dance Festival, having performed four times with Beyond Repair Dance as well in the distant murky early years of Cloud Dance Festival. More details of Hana and her work can be read here. Although this is the first time Gary Rowntree, from Belfast, will be presenting work at Cloud Dance Festival, this will be his second festival, having performed at our last festival in Antony Lo-Giudice's company, then called Exquisite Corpse | Dance Theatre. Gary's new work is a solo called The Light, which will be performed by Oona Doherty on Saturday 6 July. For further details about Gary and his work, please visit here.